2 women attempt a world first paddle along the remote and stormy Aleutian island chain. Over a thousand miles from the nearest coastguard, they only have each other to rely on. 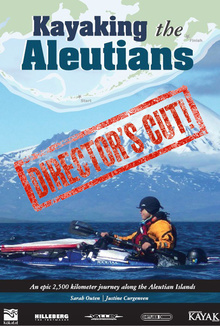 2 women attempt a world first paddle along the remote and stormy Aleutian island chain. In a nail biting adventure, Justine Curgenven and Sarah Outen are swept away from land by unknown currents, approached by bears & grounded by headwinds. Sarah has only just learnt to roll her kayak and is frequently terrified but the wild and unpredictable seas. Both women deal with frequent hazards with good humour. Over 101 days, they gain a rare insight into themselves & the lives of the few people who live in this harsh, beautiful landscape. This is the Directors Cut, with 15 minutes extra footage.